My mom has a hook by her door where she hangs a wreath at Christmas time. However, that little hook is quite lonely the rest of the year, because she doesn't ever use him for anything else. So, I decided to solve the problem. I received a really great box of paints from DecoArt, some of which were patio paints. They are super durable and are designed for outdoor pieces, so they were perfect for the wooden welcome sign I was planning for my mom. Today, I want to show you what I did. For a more in depth description, you can watch the Google Hangout below, which aired live on April 22nd. 1. Start with a basic wood sign. I purchased mine at Michaels. Wooden welcome sign gets some red patio paint. 2. Paint the top layer of your sign. I used red for mine. The patio paint gave great coverage. 3. 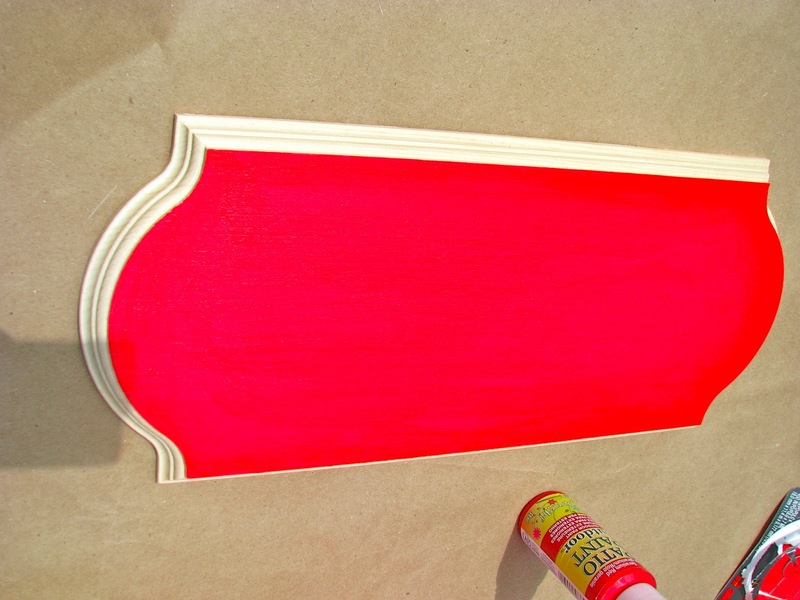 Paint the trim for your sign. I painted white in the center and black on the outer edge. When painting the black trim, I used painters tape to seal off the white trim. 4. Either paint "Welcome" on your sign, or transfer a reverse printed "Welcome" image. I tried a couple of ways to transfer my image. Unfortunately, they were not the best methods for me. For the full story, check out the video below. You can find several image transfer methods at The Graphics Fairy. 5. Seal your wood sign with Mod Podge. I used hardcoat Mod Podge since the sign would be hanging in a covered area. However, if your sign will be exposed to the elements, you might want to use the outdoor Mod Podge. I hope my Welcome sign made from wood inspires you to create a sign of your own. Checkout the video below to hear all of the errors I made with my transfer and what I did to correct it. You will find that a project is rarely ever too far gone, and that the DecoArt patio paint is extremely durable. As always, feel free to email me with any questions you may have. *I was given DecoArt paints to use for my Google HoA project, but the project and opinions here are 100% mine. *Linking up at Domestic Superhero. LOVE the bright red color! Thanks for sharing! Hi Niki! visiting thru Domestic Superhero... great sign. I've not tried to tackle these word projects and I like yours very much. Red is my favorite color.